The modern history of Sangiovese is closely tied to the life of Giulio Gambelli. 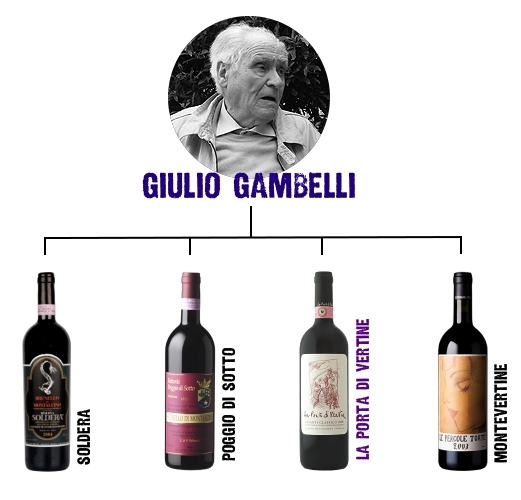 Born 1925 in the centre of Tuscany, Poggibonsi, Gambelli began working with the grape variety at the age of 14 as a cellar hand at what was then one of the largest wineries in the region, Enopolio. Never having received any official training as oenologist, his talent and his fabled capacity as a taster soon got the attention of the winery’s director, Tancredi Biondi Santi, who appointed him as his assistant in Enopolio’s laboratory. This phase proved seminal for Gambelli’s belief and love for Sangiovese, as Biondi Santi was also the custodian of a Sangiovese clone he had isolated in one of his vineyards, Il Greppo, and which would become world famous under the name Brunello di Montalcino. Giulio Gambelli is, so to speak, Italian HENRI JAYER. Gambelli’s knowledge of the grape variety is second to none and he has consulted some of Tuscany’s most famous estates(ex : SOLDERA, POGGIO DI SOTTO, MONTEVERTINE and LA PORTA DI VERTINE), which have all one thing in common: Sangiovese as the expression of the Tuscan terroir. Pristine cherry, anise seed, cola, balsam herb and almond paste. There’s a touch of softness buried within what is otherwise a tightly textured tapestry of flavors. In terms of texture, the wine is infinitely silky and long. RP95,AG97 This wine was to be released as "Brunello di Montalcino Riserva. But he released this vintage 2007 as "Toscana IGT" because resigned from Brunello Consorzio. 2007 Toscana IGT(former Brunello di Montalcino) was bottled only 2000 bottles. The quality and specification is exactly same as Soldera's Brunello di Montalcino Riserva. This wine was to be released as "Brunello di Montalcino Riserva. But he released this vintage 2008 as "Toscana IGT" because resigned from Brunello Consorzio. Its quality and specification is exactly same as Soldera's Brunello di Montalcino Riserva. Tiny volume were bottled. The 2013 Chianti Classico is a wine of profound character and depth. This expression is only Sangiovese, whereas other vintages see a tiny addition of Canaiolo for extra color and intensity. This vintage reveals excellent fruit quality with an earthy, iron-like note that sets it apart. The wine offers great richness in the mouth with elegant contours and bold fruit flavors. It is aged in oak for 18 months. RP91 More expressive in its bouquet than the Montevertine. Hard candy, sweet red berries, flowers and spices are some of the notes that emerge from this unusually open, accessible Pergole Torte. RP92,JS93 In fact, this wine had been released as "Brunello di Montalcino Riserva in the beginning. He changed label of remaining lot and released as "Toscana IGT" after resignation from Brunello Consorzio. Sweet red cherries and freshly cut flowers. The 2009 is a highly attractive, oozes class and elegance. RP94 2005 Brunello di Montalcino Riserva in perfect condition(OC), directly from winery / You may know sad incident of Soldera happened in 2012, lost 6 vintages of Brunello di Montalcino. This is a precious bottle of 2005 which was released just before that catastrophe. Italy’s most widely planted, and therefore, arguably, its most important red grape variety. Approximately 10% of Italy’s total vineyard area or 100,000ha are devoted to this varietal. It is the main grape in Chianti Classico, its 6 sub zones, as well as Brunello di Montalcino and the most important part of the blend that is Vino Nobile di Montepulciano. In addition to these internationally well known wines Sangiovese features as an either large or small ingredient in a staggering 259 DOC’s according to the Ministero delle Politiche, Agricole, Alimentari e Forestali. This means that Sangiovese can virtually be found in every corner of Italy, and more and more in wines from abroad. Because it is so prolific, Sangiovese may seem an undemanding grape, easily adapting itself to very different soil and climatic conditions. However, judging from a sea of indifferent wines made from this grape, it is far less accommodating than the statistics suggest. Sangiovese’s main draw back is that it ripens very late, making it generally unsuitable for more northerly, cooler regions, or altitudes over 350m. As it is literally all over the place, many of the sites planted with Sangiovese may not be able to provide the long autumnal seasons needed to ripen Sangiovese properly. When not fully ripe, Sangiovese can be marked by high, almost tart acidity, and drying astringent tannins. The rains that come with the change of seasons complicate matters further, as the grape is thinly skinned, and prone to rot. As the variety doesn’t show an enormous amount of pigments, the wines tend to be very light in colour, especially from overcropped vines and the main reason for compromising its reputation as one of Italy’s outstanding grape varieties. Sangiovese has been known in Central Italy, and especially Tuscany, for many centuries. Research suggests that the Etruscans already were familiar with the grape. The grape’s name allegedly stems from “Sanguis Jovis”, or “blood of Jove”, but in general its skin does not possess the amounts of colour pigments, which could satisfactorily support the traditional explanation, which refer to this. Unfortunately, deeply coloured red wines are, often erroneous, associated with quality, which is why the medium coloured Sangiovese is not seldomly judged at face value. Sangiovese has been the subject of official recordings describing its characteristics from the 18th century on. Already at that time the acidity of the grape was noted, and ways to mitigate it discussed. In the 19th century Barone Bettino Ricasoli, proprietor of the Brolio estate in Gaiole, formulated the classic Chianti “recipe”, in which he suggests blending Sangiovese with softer grape varieties like Canaiolo as well as the white Malvasia and Trebbiano, which were present in abundance in Tuscany’s vineyards at that time. Although this “recipe” became a very prominent chapter in the history of Chianti, it is often overlooked that Ricasoli thought blends including white varietals suitable for wines destined for early consumption only. Unfortunately, no such exception was taken in consideration in the Italian wine law that followed in the 20th century. It is here that most of the damage was done, as the law not only allowed high yields, but also forced the inclusion of white grape varieties in the fermentation vat, the reason for this extreme measure being a historical one: for a very long time the cultivation of grapes in Tuscany was but one of the agricultural activities of any estate. Systematically planted vineyards, devoted to one single grape were a very rare sight indeed. Things got worse after the war, where socio-economic changes saw cheap labour disappear into the cities, and many estates changed hands. To make them profitable, monoculture was introduced with an emphasis on quantity. Vineyards were planted with inferior Sangiovese clones, which could nevertheless produce very high yield. The resulting wines appeared as Chianti at the lowest price point possible in retailers around the world. The region soon became the hunting ground for supermarkets looking for large quantities of wine dictated by a price the consumer was willing to pay for Chianti. Supermarkets work with contracts that are drawn up long before the first flowering of the vine. When the following harvest produces less volume than sold on contract, it is clear that some creativity will be required to fill the gap. In an environment like this, estates focusing on quality were either unwilling or unable to label their produce under the Chianti Classico name. Unwilling, as the reputation, or rather its absence, would make these high quality wines a hard sell, and unable as the wine law didn’t allow new practices as small oak casks, nor in a bizarre way, would legally recognise a wine made of 100% Sangiovese. So poor was the general reputation of Chianti Classico at this time, that many quality producers would shun Sangiovese altogether and plant international grape varieties, mostly Cabernet Sauvignon and Merlot, to attract the attention of an international market. These wines could only be labelled under the lowest wine category possible, Vino da Tavola, but bizarrely represented the best Tuscany had to offer, and therefore became known as “Super Tuscans”. The Vino da Tavola category became a playing ground for experiments with international grapes, modern vinification techniques and maturation in the French Barrique. The government put an end to this by introducing amendments to the original laws that had only favoured “traditional methods and grapes”. These amendments removed the obligation of adding white grapes to the Chianti blend, as well as stating a minimum for Sangiovese and not a maximum. In this way 100% Sangiovese wines became a legal reality. The Vino da Tavola designation was made impotent by banning the name of the grape as well as the vintage on the label and introducing the IGT (Indicazione Geografica Tipica), which is nothing else but a Vino da Tavola with a geographic description, allowing for enormous flexibility in grape variety choice and vinification methods. The origin of the grapes, or the concept of terroir, plays virtually no role as the IGT’s demarcation in general can encompass the whole region, and wines with an international profile are the rule under the IGT banner. Eventually, more producers grew tired of the dominant impact of Cabernet Sauvignon and Merlot, which, even when used in small portions in the blend, easily mask Sangiovese’s subtle qualities, and started to focus on a 100% Sangiovese blend. As a result, Sangiovese was increasingly recognised as an outstanding grape variety, its true qualities having been obscured either by high yields, the addition of other grape varieties (notably white ones) or a combination of the two. Analogies with Pinot Noir were explained to an audience used to the international blend the true characteristics of Sangiovese in general and Chianti Classico in particular: perfumed, elegant wines, with acidity as a structuring element, qualities that could easily be overshadowed by too enthusiastic oak ageing. Therefore, many producers started to steer away using new French oak and reintroduced the traditional large Slavonian oak casks. The turning point in Sangiovese’s re-appraisal came, when at last the region turned its attention to clonal selection. A long term research project on the easily mutating Sangiovese was implemented by the Consortium of Chianti Classico producers. The project was triggered by the inescapable realisation that by the year 2000 the low quality but high yielding Sangiovese clone, with which most vineyards in the Classsico area were planted since the 1970s, would be more than 25 years old. As most vines become uneconomical and low yielding at that age and are often grubbed up to be replaced with new vines, the Consortium foresaw a planting wave at the beginning of the 21st century, and was well aware, that the chance to promote superior clones of Sangiovese had come. In order to be able to advise its members on the right choice, several member vineyards were selected to plant different clones on different rootstocks.